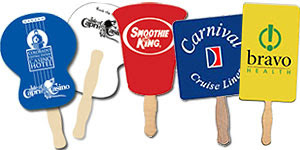 Beat the heat this summer with personalized promotional items from PrintGlobe! We have all of the summertime essentials to make promoting your business or event a blast. Creative summer promotional products are a fantastic way to generate customer awareness that will last all year long! Put your brand right in their hands with personalized hand fans! They are the number one promotional product for advertising your business while on a budget. Printed hand fans also make excellent hand held signs that promote while you wave. They can be personalized to fit your needs and come in a variety of shapes and sizes to accentuate your logo. Refresh your brand identity with custom printed bottled water! 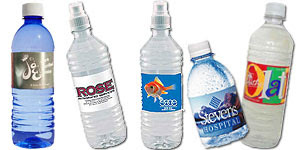 Personalized bottled water is a fantastic way to keep customers and clients cool while keeping your promotions hot. Your custom artwork will stand out from the crowd when imprinted on high-quality labels. Drink to a successful summertime promotion and browse our selection of logo bottled waters today! Show your customers, employees and business associates you care by providing custom sunscreen at your next event. Personalized sunscreen is a great way to promote while having fun in the sun. 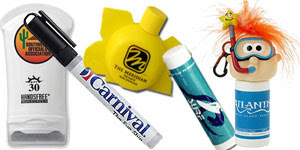 Promotional sunscreen and logo sun lotion will keep your customers safe while your logo shines! 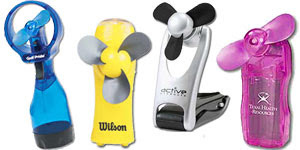 Blow away the competition this summer with printed battery powered fans and logo misting fans. Our unique fans will ensure recipients stay cool and your custom imprint looks hot while out in the sun. Customized battery powered fans will charge up your next event while printed misting fans will make promoting a breeze. 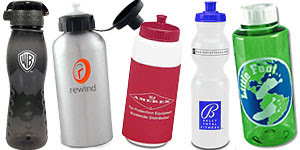 High-quality sports bottles are a popular promotion all year round, especially during the sweltering summer months. Personalized sports bottles keep people cool and hydrated during the summer. They will get repeat usage which means repeat exposure for your custom imprint or logo. These sizzling summertime promotions are a hot commodity that will reach a wide audience. So, remember that summer is here. Take advantage of this fantastic promotional opportunity to increase awareness of your business or event. Hot summertime promotions are an excellent way to perk up sales, generate traffic and spread awareness that will last a lifetime. PrintGlobe is here to help you promote successfully while on a budget.